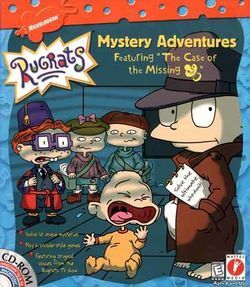 Rugrats Mystery Adventures is an adventure game that was released by famous toy manufacturing company Mattel for Microsoft Windows, on September 15, 1999; as the name suggests, it is the sixth title in the Rugrats series. Mattel also previously manufactured the "Dare to Scare" toyline for Klasky-Csupo Inc.'s second Nickelodeon cartoon Aaahh!!! Real Monsters in 1995 (which was made up from Ickis, Oblina, Krumm, Dr. Gromble, and eight brand-new monsters who never appeared in the show). Be a Super Sleuth! Pickles, Tommy Pickles. He's not only the best private detective in town, he's the only one. So he could use your help! Tommy's working on ten different cases for his clients, Missus Susie and Missus Angelica, Who drank Susie's chocolate milk? Did Angelica swipe Phil & Lil's buried treasure, or was she framed? Help Tommy get a clue! First, snoop for clues! Your caseload could include any one of ten brain-teasing mysteries. Next, collect the evidence! 6 different arcade-style activities, help you pry top-secret clues from secret informants. Choose your games, test your skills! Follow your branches to solve the ultimate who-dunit! This page was last edited on 12 November 2016, at 10:00.